This poem came out of the April 4, 2017 Poetry Fishbowl. It was inspired by prompts from alexseanchai, mama_kestrel, and kelkyag. It has been sponsored by redsixwing. says, "kintsugi can mend it." The tanka is a syllabic form of poetry with five lines. There are simple and complex instructions for writing a tanka. Kintsugi is the art of repairing broken pottery with metallic resin. It also extends to the idea of repairing a broken life. Enjoy some examples. It's easier to follow the steps if you have a kintsugi kit, but you can also assemble the components from scratch. Kigo are symbolic words that encode the season into a Japanese poem, usually a haiku but they can go anywhere. Brows a big list of kigo. A begging bowl is one of the requirements for a Buddhist monk. Read more about how Buddhist monks live. tsukutsukubooshi (tsukutsukubooshi, early autumn). A small cicada; the name is onomatopoetic for its cry and includes the word for 'priest'. Meimuna opalifera. wind in the reeds (ogi no koe, early autumn). Lit. 'voice of the reeds'. 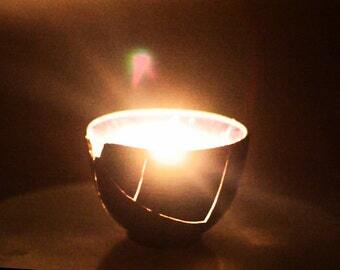 This kintsugi lamp shines from within. Wabi and sabi are principles of Japanese aesthetics. Although often compounded, they are not the same: wabi is about simplicity and rustic imperfection, while sabi reflects the graceful passage of time and impermanence. How do you DO that? (frames a question, then re-frames it, because reasons) Do I want to know how to do that? If you mean how do I know when someone needs to read a particular poem, that's mostly intuition. The poems tell me where they need to go, it's a bardic thing and being in tune with the Universe. Some folks do it with people skills, and it does work better if I know what's going on in someone's life, but other times the idea just pops into my head out of the blue and I'll send something. Or people stumble across exactly the poem they need when they need it -- I get several of those comments a year. If this sort of skill interests you, I can tell you that it's in the same cluster along with channeling Santa Claus, being able to find exactly the right gift without the recipient telling you what they wanted. It's based on wisdom, intuition, and resonance. The other version based on intelligence, logic, and extrapolation also works. I tend to use the intuitive version inbound (it finds me) and the logical version outbound (I need to pick something to send). The former has a higher success rate, probably because the Universe knows more than I do. Now that it's been sponsored, feel free to share it with anyone you think would enjoy it. I actually named one of my comics, Cracks of Sunshine, after kintsugi, and that old line, "blessed are the cracked, for they let in the light." This poem helped comfort me. Thank you. :D That's a lovely idea.